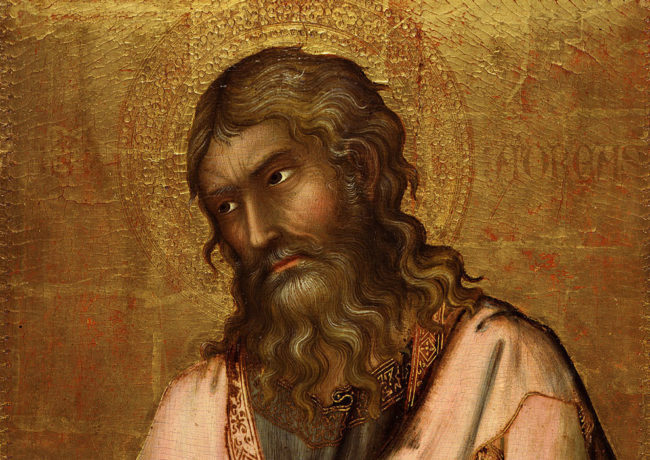 Last week our look into fresco painting revealed aspects of a demanding technique. This week it’s tempera technique that’ll make us marvel. Until the late 1400s (when oil painting took over) Medieval and Renaissance artists created images in tempera on panel. The panel is wood and the type used depended on local trees. Italian panel paintings are done on poplar; Flemish artists used oak and Germans oak, fir, lime and pine. Here’s the Italian Duccio (c. 1260-1318). 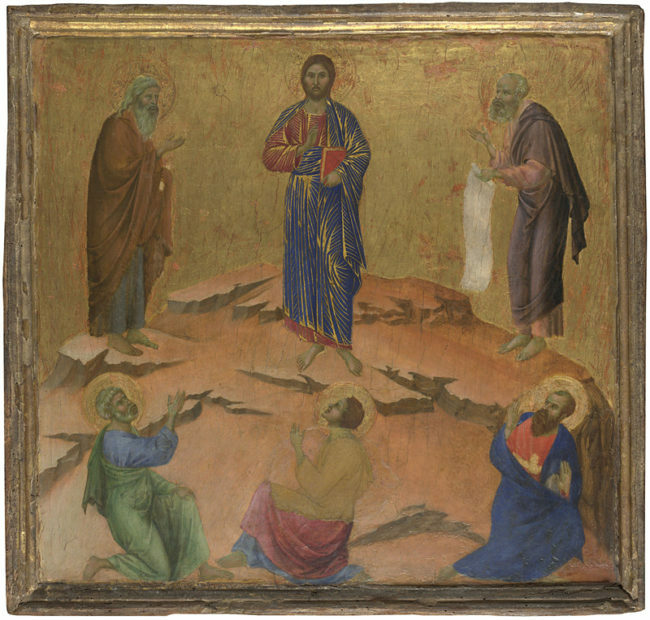 Christ appears transfigured before apostles Peter, John and James. Moses is on the left of Christ, Elijah the right. 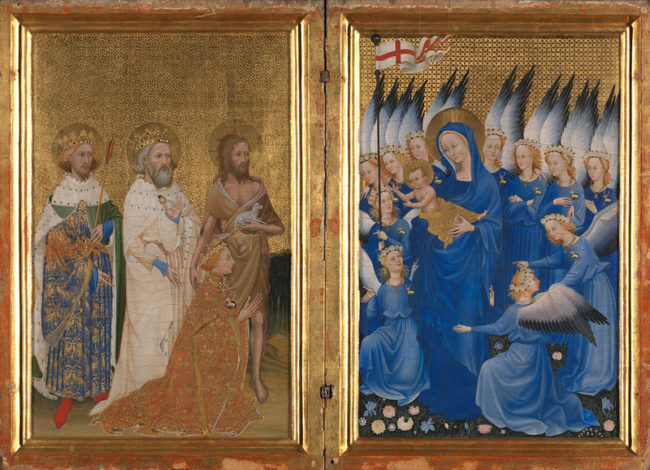 This panel was part of a huge double-sided altarpiece called the Maesta completed for Siena Cathedral in 1311. 1) Several planks of wood are glued together and secured with beams across the back. Using several planks reduces warping. The assembled panel is planed smooth. 2) The panel is covered in layers of white gesso (liquid plaster) to refine the surface and make it non-absorbent. 3) The artist maps out his composition on the gesso. 4) Ground pigments (from minerals, plants, insects) are blended with water and egg yolk to create paint and the real work begins! This is Leonardo da Vinci’s Annunciation painted in tempera on panel. 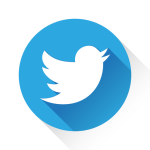 Tempera is an egg-based paint which may seem odd. But egg is stable and gives good consistency. It adheres to the gesso. Tempera’s big plus point is the richness of colour achieved. Where fresco is pastel tempera is punchy. Strong colour stands out even in a dim church interior. Of all the colours in the tempera jewel-box blue is the most prized: made from semiprecious lapis lazuli (quarried in modern-day Afghanistan) our name for it (ultramarine) still derives from the Italian “oltre marina” (over the sea). 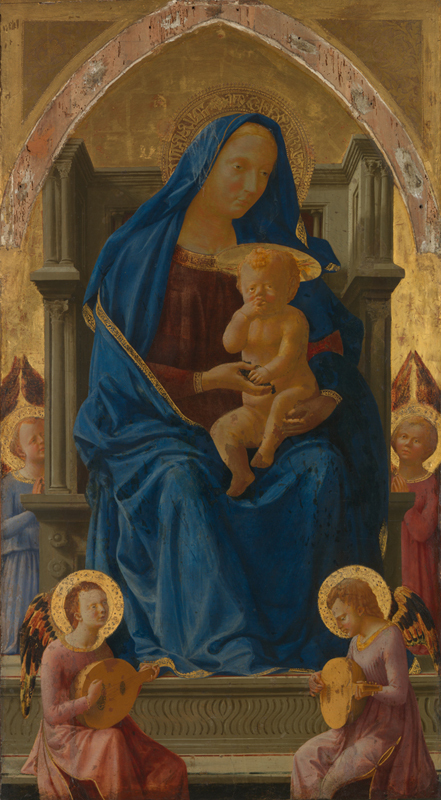 This Virgin and Child is by the Italian Masaccio (1401-1428) and formed part of a multi-panelled altarpiece for a church in Pisa. Those rivers of blue on her robe stress economic outlay and symbolic significance. Tempera’s less useful aspect: the paint dries in minutes. Blending or transitioning from one colour to the next becomes hard so tempera artists developed specific techniques. 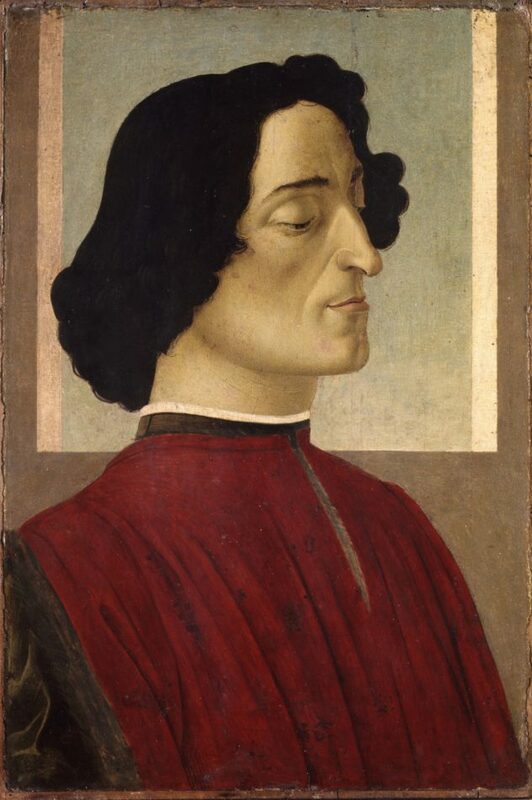 In this 1480 portrait of Giuliano de’ Medici Botticelli has built up thin layers of paint using hatching strokes (lines side by side). 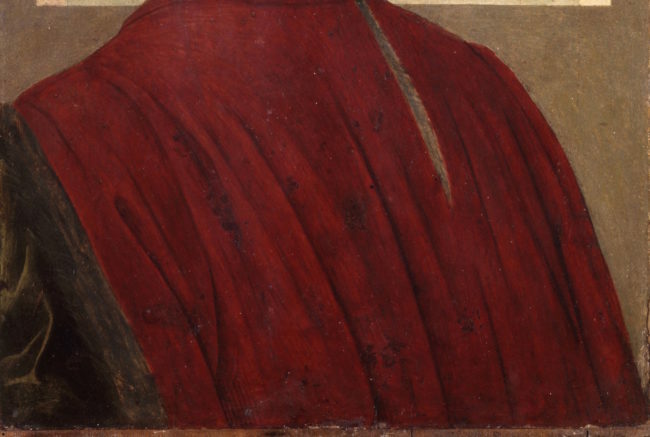 From a distance the tonal gradations in the red garment appear blended and smooth. Get closer and you’ll see that Botticelli has laid down the bright red first and then placed fine thin lines of darker paint on top (either closely hatched or spaced further apart) to create the impression of 3D form and texture. Done with a super fine brush (just a few bristles I think) this is where tempera painting becomes very detailed, almost like drawing. You’ll often see gold in religious tempera painting. Many early Italian painters worked in the Byzantine style of the time using lots of gold. 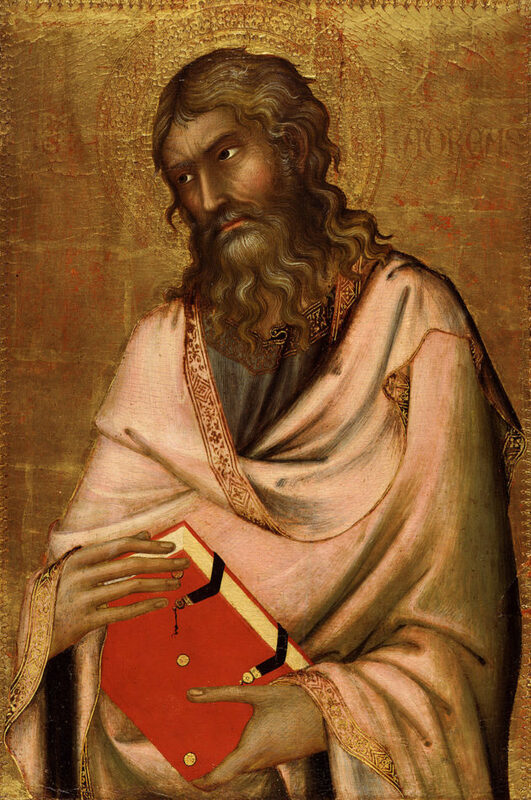 This is Saint Andrew by the Sienese master Simone Martini (1315-1344). This panel is again part of a larger altarpiece. 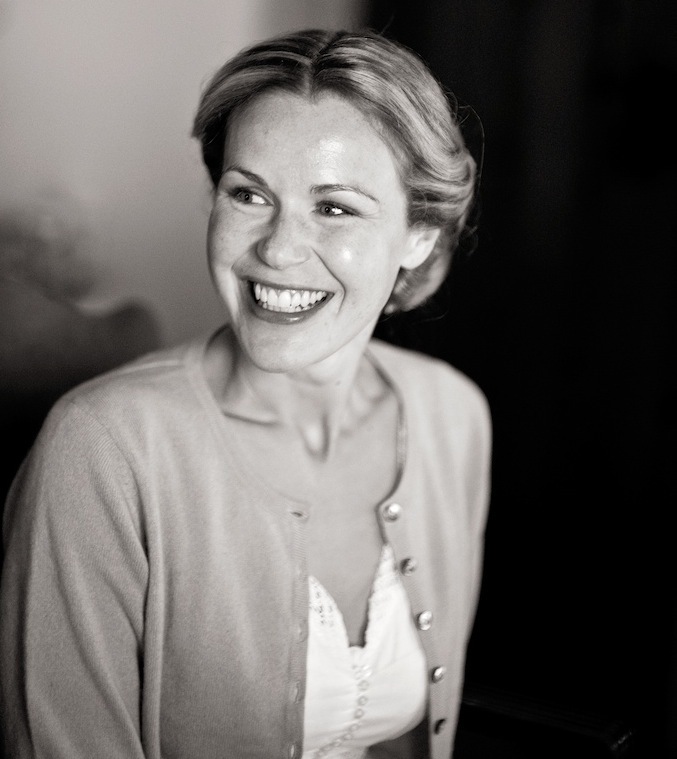 Imagine all that gold set aglow by candlelight in a church. Heavenly. Gold (real gold) is pounded to filmy thinness. A sticky red clay (called bole, from the Greek word for earth) is painted onto the panel and the gold leaf adheres to it. Bole gives the gold a warm tone. The background here reveals the bole through areas of effaced gold. Spot too a faint grid pattern telling us where the sheets of gold leaf were applied. Andrew’s halo is made through a technique called tooling: a fine-pointed tool is pressed into the panel to create decorative indentations that catch the light and draw the eye. Once oil painting was introduced its great benefits for artists meant tempera technique fell away. But after centuries of neglect it enjoyed a limited revival at the hands of early 19th century artists like William Blake. 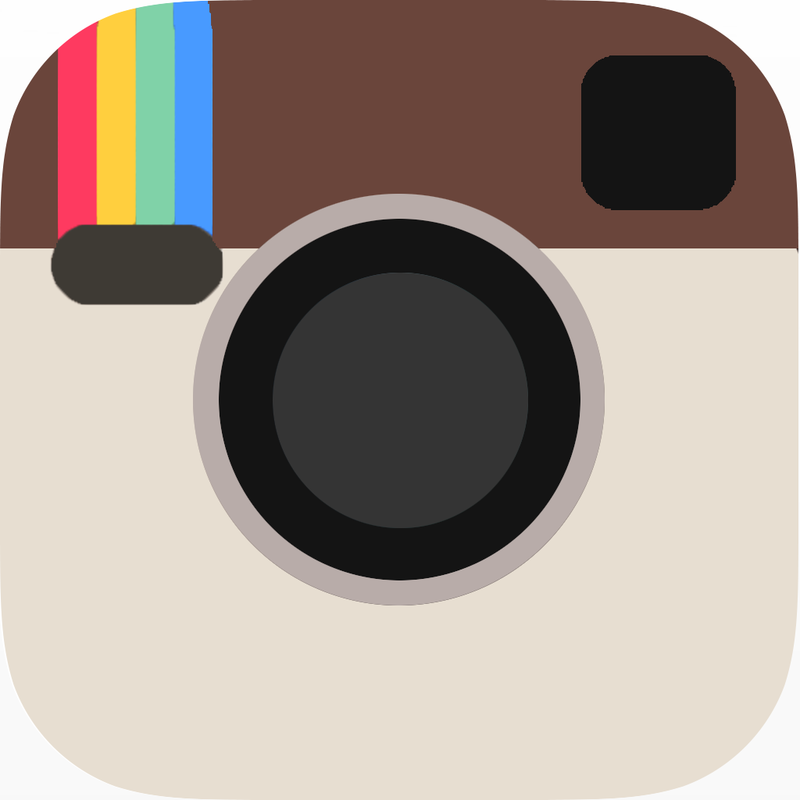 Some 20th century painters also used tempera, including the Norwegian Edvard Munch (1863-1944) and Giorgio de Chirico (1888-1978). 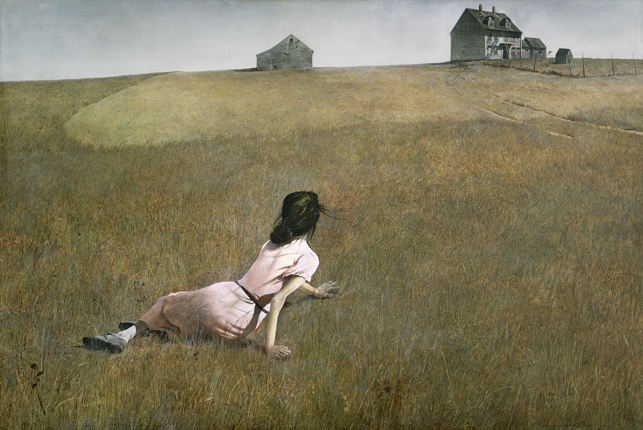 In America the tradition was taken up by American Scene painters like Andrew Wyeth (1917-2009). This is his well-known painting Christina’s World from 1948. With what we now know about tempera technique why would Wyeth have used it here?